experience which you will never forget. 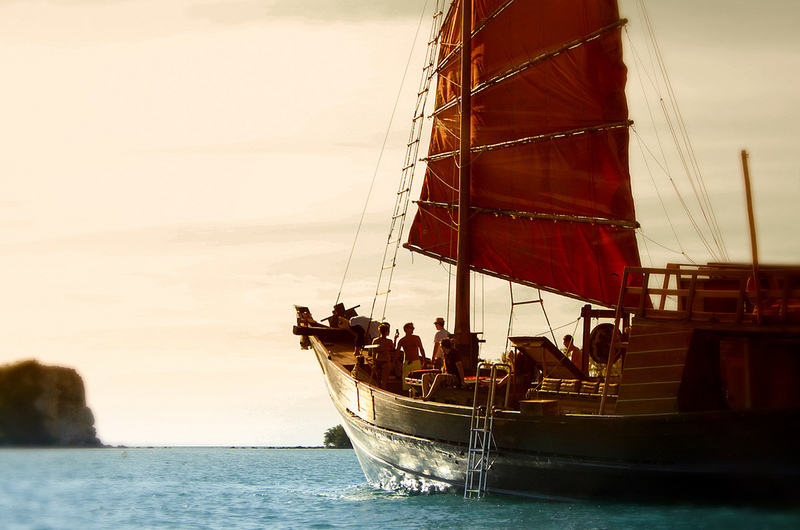 Welcome aboard the Chantara and Siamtara for a spectacular cruise to discover Koh Samui and it beautiful surroundings. The cruise will show you deserted beaches, secluded coves and dazzling sunsets. Traditional in appearance, the Chantara and Siamtara are out-fitted with all modern equipment for safe and tranquil sailing. These Myanmar traditional wooden junk boat are build in teak and other tropical wood with a secular knowledge. The Chantara will take you on an adventure to discover the beautiful underwater world and landscape around Koh Phangan, view the beautiful scenery in the islands of Ang Thong Marine Park, or explore the underworld of Koh Tao. The Chantara’s comforts will leave you carefree to be cradled by the waves while you relax in the boundless beauty of Thailand. Enjoy a cocktail and appetizer during the sunset. You can charter our ships for any private party as wedding, birthday, family meeting, bachelor or staff party. Every our private full day cruise, half day cruise, sunset cruise or overnight cruise are tailor made. Watch our video below for inspiration. Regardless of destination you are assured an amazing trip and an unforgettable day. The exclusive excursion in Samui for snorkeling, fishing, relaxing, swimming in clear water of Thailand golf, away from the massive tourism destination. We decided to do this tour as it seemed to promise a good mix of activities plus a chance to explore of the coast of Koh Samui. The whole day was wonderful - cold soft drinks provided all day, a delicious lunch ( cooked fresh on board ) with 5 different dishes to choose from, an afternoon snack of ice cream and then steamed dim sum on the way back. The alcohol for purchase onboard was cheap with generous serves. I swam and fished ( no luck as it was too sunny ) and in general it was one perfect holiday day. The visit to the Flip Flop Pharmacy and Bar was fun - one of the best Long Island Teas I have had in a long time. A warning though, more than two will result in the need to take nap once back onboard. Best Boat Trip in Samui!